Comments: The struggle for the galaxy becomes more intense when the All Terrain Armored Transport (AT-AT) Imperial Walker enters the battlefield. This powerful reproduction makes an amazing display piece for any collector or a deadly addition to any Star Wars Miniatures battle. 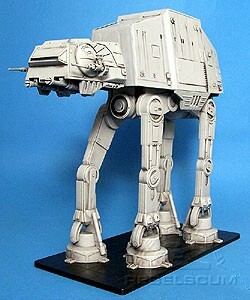 Can any Rebel squad stand against the power of the AT-AT Imperial Walker? Use the AT-AT Imperial Walker to relive the Battle of Hoth or create your own Star Wars experience. The All Terrain Armored Transport. The Walker. The AT-AT. This formidable mobile weapons platform personifies the Imperial doctrine of "rule through fear" and is the most terrifying assault vehicle in the Empire's arsenal. The command deck, housed within the walker's "head," features stations for a pilot and gunner, as well as a command station for combat coordination. The most famous engagement involving AT-ATs was the Battle of Hoth. On that ice-covered, remote world, the Rebel Alliance established a command center called Echo Base. When the Empire discoverd activity in the desolate system, it launched a massive attack that included Imperial Walkers and battle-ready Snowtroopers. The Rebel forces had no hope of victory in the face of such weapons of war. All they could do was fight to delay the advance of the Empire's forces to give their transports time to escape. Now, with this massive AT-AT figure, you can re-create that fateful battle-or devise new scenarios of your own! This figure isn't a game all by itself. You need a copy of the Star Wars Miniatues Starter Game, which includes the full game rules. You'll also need additional miniature figures to play the scenarios described in the included booklet, which are available in Star Wars Miniatures Booster Packs. Collect your favorite characters and build a squad, then challenge a friend! The AT-AT Imperial Walker can be unscrewed from the base and displayed on its own.